As much as I’d like to believe the holidays aren’t right around the corner, the 2 inches of snow and the 8 foot Christmas tree display at my local Target have convinced me otherwise. I don’t know about you, but I really struggle with gift-giving at the holidays. My kids are not immune to the school bus chatter and the thick, glossy ads in the Sunday paper. The newest iPhone, an XBOX with its enticing array of inappropriate games, toys that talk, light up, and do all the playing for you … these wants and wishes conflict with the kind of play I want my kids to experience. The OgoSport OgoDisk RAQ is one of my favorite purchases of the year. We used it in the summer and fall outdoors (it’s awesome at the pool, too! ), and now we’ve brought it in for basement play. It’s easy enough for little kids to play, but still fun and entertaining for grownups, too. The PlasmaCar is on our wish list after Eli played with one in Spain. I always assumed it was a little kid toy, but Eli loved it. It moves by using centrifugal force, friction, and kid power … or even adult power! It holds up to 220 lbs, so give it a spin! We got our starter Snap Circuits Jr. kit for Christmas 2 years ago, and it’s one of those toys that keeps seeing playtime. The best part about it is that you can easily add on and expand as your kids get more into it. This year the Elenco Snap Circuits Lights Physics Kit is on our list. My kids love mixing tech and toys, so I know they’ll be way into this. I have my eye on the Hoberman Switch Pitch color-changing ball for a fun stocking stuffer after seeing it mentioned by a few other parents. We survive winter by letting the kids go crazy with balls in the basement, and I think this fun contraption would be a game-changer! The Diggin Active Dodge Tag game is another perfect indoor/basement activity for kids that need to get rid of some pent-up winter energy! I think it would be a great alternative for NERF guns, too – whether you’re opposed to toy guns or you’re just tired of hearing arguments about who got hit when. The ball sticks to the vest, so if you’re hit, you know it! How fun would it be to get everyone in the family their own vest and have a big, rowdy family game of dodge tag? We didn’t bring any toys with us to Spain, and only a couple of games. But my cousin had a puzzle similar to the Perplexus Epic at his house and it kept the kids, well, perplexed! Bounce-Off is one of those games that I’m seeing everywhere right now. I love the concept. You have to bounce your balls so that they land in the same pattern as the challenge card you draw. It’s an active game, which will definitely appeal to kids who might not enjoy sitting down for a traditional board game, but at the same time it can be played by all ages. I think this one is going to be a hit not only with our family, but with the kids on our street, too. We’re big fans of just about any game Blue Orange puts out. Our latest Blue Orange favorite is Brave Rats. It’s similar to War, but the cards have special powers that can overrule the number. I keep it in the car for travel and long waits at restaurants, since it’s a fast-paced game and the small carrying tin slips easily into a purse or backpack. It would make a great stocking stuffer for any game-loving kid! Chances are, if you’ve got a kid between the ages of 7 and 12, you also have a Minecraft fan in your house. As much as I love the creativity of the game, I don’t love hour after hour spent in front of a screen. That’s why I’m super excited to see that LEGO has come out with a line of Minecraft-themed kits just in time for the holidays. There are several, but I especially like the LEGO Minecraft Crafting Box . I see endless hours of kids creating their own LEGO Minecraft realms and using these bricks with them. And maybe, just maybe, building sets like this will help parents to finally understand the difference between a creeper and an enderman. I’ve recommended (and purchased) a Kiwi Crate subscription for years. I was dreading the day the kids aged out of them … but no more! They’ve recently introduced three new members to the Kiwi Crate family, and two of them are perfect for tweens and teens. 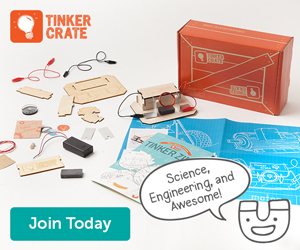 The Tinker Crate is geared toward ages 9 and up, and integrates science, engineering and technology into a fun project. 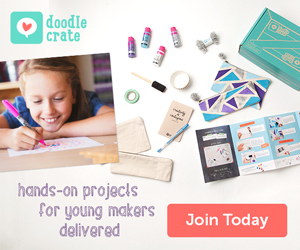 The Doodle Crate is geared toward girls ages 9 and up, and features a creative and crafty DIY project each month. We’ve played around with both crates, and I’m happy to report that they were big hits. I continue to be impressed with the quality of the materials and the longevity of play value these crates consistently provide. As an added bonus for you early shoppers, you can get 60% the first month of a new subscription to any of the Kiwi Crate family brands. Just shop the Black Friday Sale and use the code HOLIDAY60. Gotta act quick, though! This offer expires 12/1/14. I’m sticking to my promise to make the book UNBORED Games my new, go-to gift for birthdays and holidays. (I reviewed it last month, in case you missed it.) A copy of this fabulous book (maybe even paired with its partner, Unbored: The Essential Field Guide to Serious Fun ) would be a fabulous choice for those picky tweens and teens. Finally! An alternative to just giving them iTunes gift cards! These Orion Astronomy Binoculars are on my tween’s wish list, and I couldn’t be happier. She’s taken a big interest in astronomy lately, and loves to spend evenings outside gazing at the stars. Good telescopes are pricey, and can be difficult for kids to use. These are affordable, easy to transport (how awesome would they be on camping trips?! ), and seem easier to for older kids to use on their own. I spotted the Joy Of Zentangle in our local library and checked it out. Have you ever tried making your own zentangle drawings? It’s so relaxing! You can find tons of ideas on Pinterest, but this book, paired with a nice set of thin markers and a sketch pad would be a cool gift for a tween or teen. And it’s not just for girls! The graphic art aspect of zentangle is just as appealing to boys (hint: even parents who don’t think they’re artsy can easily get into making zentangles). I hope this helps make your holiday shopping a little easier! If you’d like even more ideas, check out last year’s gift guide. We still love all the toys on that list, too! If you like anything you’ve seen here, be sure to pin it for reference while you’re shopping. The best gift you can give me this holiday season is to share this gift guide with your friends – I’ll be happy, you’ll look awesome, and your friends will be thankful. It’s the gift that keeps on giving! Awesome ideas. My brother bought the Perplexus for my oldest one year, It’s addictive even for adults.